This majestic cichlid is one of the essential species in the aquarium. It is sturdy and easy to maintain, making it a star of beginner aquarists. 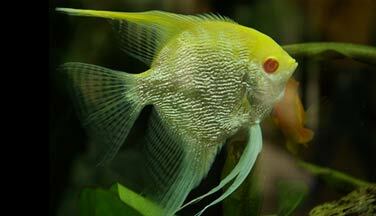 You will find in this sheet all the information necessary for the good health of your Angelfish. How to feed the Angelfish? Very easy to feed, these large fish are omnivorous with a carnivorous tendency. The key to good health is a varied diet: dry foods specially adapted to their needs (straws, granules), live or frozen prey (bloodworms, brine shrimp, mosquito larvae, daphnia...). Fill in occasionally with vegetables. 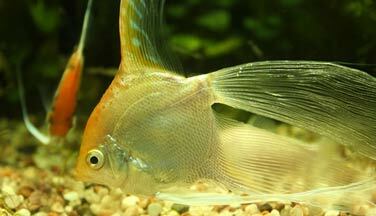 What kind of behavior does the Angelfish have? 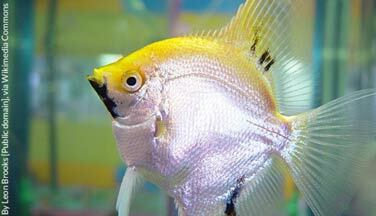 The Angelfish lives naturally in a hierarchical group of several individuals. One will avoid then to maintain it alone or in couple to satisfy its gregarious instinct. 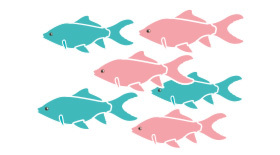 In order to spread the aggressiveness of the dominants and stabilize the hierarchy, count a group of at least 6 fish in at least 360 liters (95 gallons). It is a calm fish and its swimming is slow. Yet it is capable of liveliness when it comes to eating or defending its territory. It also becomes more and more territorial with age. It will be mostly peaceful, except during the breeding season when it is aggressive with its congeners. 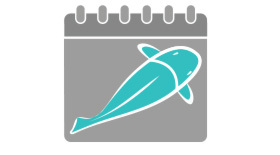 You can also see it «touching» its environment with its long pelvic fins turned into antennas. 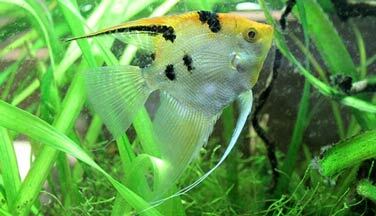 Who can live with the Angelfish? 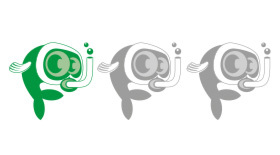 The small fish shoals can cohabit with the Scalars without much loss, provided that the Scalars were introduced after them into the aquarium, and that they grew up in the presence of this species. Without these conditions, adult Scalars are predators of small fish such as Neons, Tetras or Cardinalis ; and in a more general way of all the fish whose size is less than 5 cm. 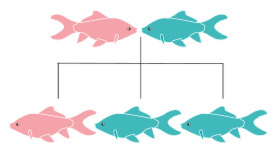 Avoid species that are too bright or tending to bite the long fins (such as the Sumatran barbs), which would then be tempted by those of the Scalar. Large, territorial and aggressive species are also not suitable for coexistence with Scalars (like other Cichlids for example). 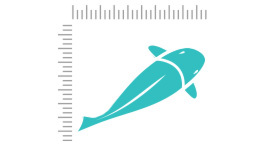 In general, territorial species of the same size should not be maintained in the same living area of the aquarium, or in too small aquariums. Finally, shrimps are also to be forgotten in a scalar box. You may want to consider the following species to coexist with your Scalars: Corydoras, Dwarf Cichlids, and Medium-sized Characidae. 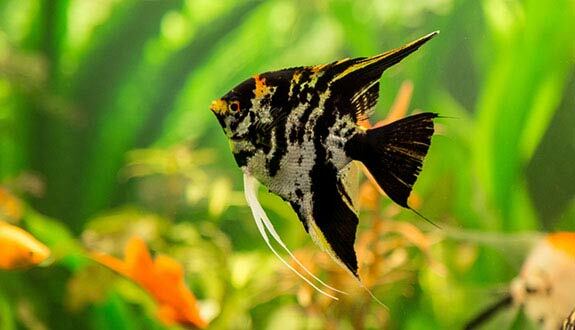 How to breed the Angelfish? The reproduction of the Scalars is quite feasible. It should be noted, however, that community tank replicas, although frequent, have very little chance of success. 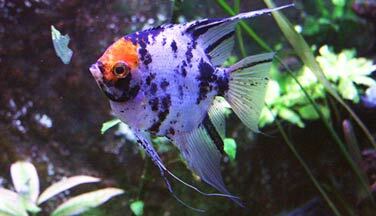 It is better to have a 200 liter (50 gal) aquarium specially dedicated to breeding. This aquarium will have no decoration or substrate, just the support for laying. 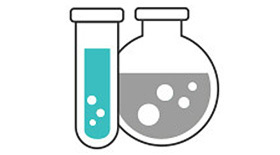 The water must have the same parameters as the life’s aquarium (temperature at 28°C or 82°F, pH at 6.8 and hardness at 5°dGH ideally). Finally, regular water changes and daily siphoning are recommended throughout the reproduction and fry rearing period. The laying supports can be quite varied: leaf, vertical stone, cone, or even on the walls of the aquarium. The couples will be formed freely. It is useless to attempt reproduction with a couple you choose yourself. Let your Scalar group grow together and couples will form naturally. Once a couple is identified, isolate it in the breeding aquarium (they become quite aggressive and territorial anyway, they defend with a lot of energy the chosen place of lay). 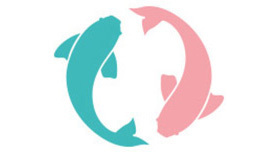 Note that sometimes two females form a couple, which will therefore give a non-viable spawn: make sure to be in the presence of a male / female couple before introducing them into the breeding tank. Parents will start by thoroughly cleaning their nesting rack. Then the female lays the eggs in line, and the male fertilizes them by following her. Spawning usually involves 100 to 300 eggs (up to 500 sometimes). Once spawning is done, the parents will take care of it by ventilating and sorting them (they will eat non-viable eggs). Sometimes, bad parents devour all their spawning. In this case, remove them quickly to save some eggs, and treat with methylene blue to avoid fungus attack. Also remove dead eggs (they are white in colour) during incubation. The hatching usually occurs after 48h at 27°C or 80°F and free swimming 5 days after hatching. You can start feeding the fry. They will begin to develop their characteristic shape after 20 days. Fry food: Artemia nauplii 2 or 3 times a day. Water changes daily (2 hours after the meal). Which aquarium for the Angelfish? As for the volume of the aquarium, a minimum of 450 liters or 100 Imp gal or 120 US gal for 6 specimens is to be expected (count 50 extra liters (13 gal) per fish) even if 500 liters (130 gal) will be more comfortable for your group. 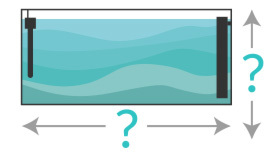 As the Scalar has a fairly tall form, the height of the water must be at least 50 cm. 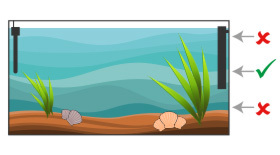 To best mimic its original biotope, a filter on peat is ideal (or water tinted by root tannins). Indeed, the water must be clear but with a tinted colour «tea». 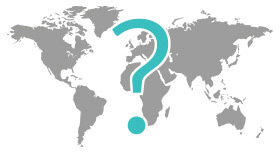 Even if the fish from the farm are quite tolerant, the following ideal maintenance parameters should be noted: temperature at 26/28°C or 79/82°F, pH between 6 and 6.8 and hardness below 8. The presence of dense vegetation and roots will simulate its natural environment in which it is most comfortable. This will also offer it many hiding places that will reduce its eventual stress. Scalars have a preference for large plants (Echinodorus Bleheri type) that gives them enough room to swim. 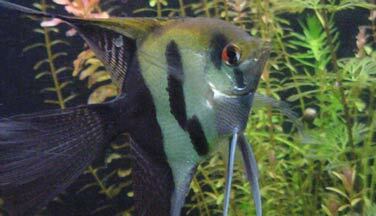 What are the colours and patterns of the Angelfish? The Wild Scalar is silver and has vertical stripes. Ornamental varieties offer over a hundred variants (marbled, black, yellow, albino, striped, koi...). There are, however, some forms to avoid, such as the scalars veiled because their large fins handicap them a lot. Their colours can vary according to their state of stress. Despite all its forms, there are actually only 3 species of Scalar: Pterophyllum scalare (described here), Pterophyllum leopoldi and Pterophyllum altum. The species Pterophyllum scalare is the most commonly encountered in aquariums. The maintenance of wild scalar is much more complicated. Ask your seller.